We created a microsite to support viral videos we had yet to see. 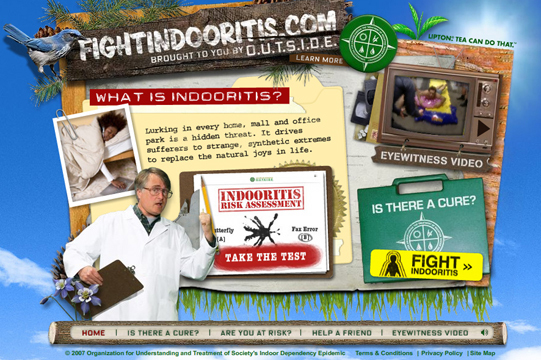 Working with the creative brief “Lipton tea can cure Indooritis” and some yet-to-be-completed viral videos, we developed a fake scientist/doctor and an activist organization (with Lipton as a clear endorser). 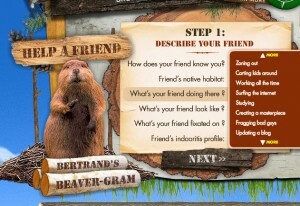 The site included the quiz to see what kind of indooritis sufferer you were, a ’50s-style educational video, and the ability to send a friend an intervention email from the fake mascot – Betrand the beaver.